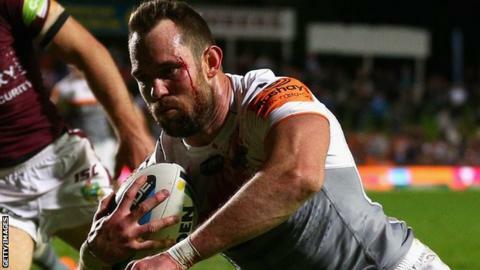 Former Wigan Warriors winger Pat Richards will return to Super League with Catalans Dragons in 2016 after two seasons in Australia with Wests Tigers. Richards, who has agreed a two-year deal, will turn 34 in February and has 10 tries in 15 games for Jason Taylor's Tigers side so far this season. The Ireland international scored 149 tries in 199 Super League games at Wigan, and was the 2010 Man of Steel. "I'm excited about coming back to the Super League," Richards said. "My family and I are excited about living in and being a part of the French culture and the new challenge of playing for the Catalans Dragons."